Campbell Timberlands to log on steep unstable slopes near the North fork of the Ten Mile River basin. THP 1-13-049 MEN (Frick Red THP) Campbell Timberlands, 570 acres; 79% selection, 15% variable retention, 6% transition, misc roadside logging. Vickanne (MD: T20N R16W Sec.11, 12, 13, 14, 23, 24). Wet weather operations, high erosion hazard, steep slopes up to 70%, landslide terrain, road failure sites, 14 road drainage work sites, impaired 303.d watershed, herbicides, coho watershed, 5 spotted owls within 1.3mi, osprey nest near haul road, trees up to 40" dbh. Estimated public comment deadline: 07/29/13. This THP is about 15 miles NE of Fort Bragg near the North Fork of the Ten Mile River basin at an elevation of 400 - 2,000 feet. Campbell Timberlands is planning a tractor and cable logging operation in an around steep and unstable slopes in second growth redwood and Douglas fir. 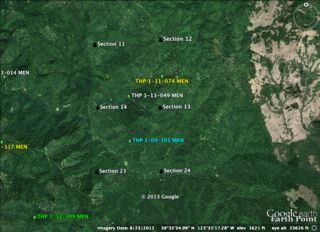 There are 10 Landslide terrain sites in the THP area including earth flows, and dormant and active landslides. The Ten Mile River watershed is listed as impaired for sediment and temperature and is an important steelhead and Coho fishery. Ground based equipment is proposed for use on steep slopes over 65% in units A,C,D,E,G; and heavy equipment is proposed for use on existing logging roads in streamside areas within units C,D,F,G. There are 14 road drainage work sites including watercourse crossings, fill failures and road bed stabilization. 5 landings are proposed in streamside areas, and there are 13 locations where tractor roads will be used in streamside areas. Units C & E have steep slopes over 50% with a high or extreme erosion hazard rating. More information is available on the THP Tracking Center website. Sierra Pacific Industries to sanitation-salvage log near Truckee, CA. THP 2-13-025 PLA (Eastmart THP) Sierra Pacific Industries, 3,745 acres; 63% sanitation-salvage, 26% selection, 7% commercial thinning, 3% clearcut, 1% roadside logging. 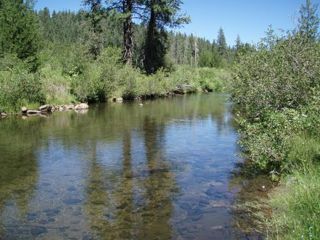 East Martis Creek (MD: T17N R17E Sec.15, 21, 22, 23, 24, 25, 26, 27, 28, 33, 34, 35). Winter operations, moderate erosion hazard, 33 road drainage work sites, slopes up to 50%, wet meadows, herbicides, impaired 303.d watershed, 1 CA spotted owl within 1.3mi, goshawk nest site, scattered large trees. Estimated public comment deadline: 08/05/13. This THP is about 5 miles SE of Truckee, CA, and adjacent to Highway 267 near Northstar Ski Area at an elevation of 6,400 to 8,400 feet. 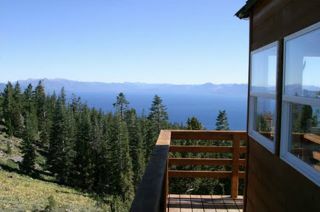 It is in a popular recreation area centered on Martis Peak which is used by mountain bikers, cross county skiers, snowmobilers and for sight seeing visits to the nearby fire lookout. Sierra Pacific Industries is planning a tractor based mostly sanitation-salvage logging operation claiming that white fir is encroaching and dying, and mistletoe is harming red fir and lodgepole pine at this high elevation. Little or no information was presented in the THP to justify that insect or disease levels are beyond the normal range of variability. The THP area includes the East Martis Creek drainage which flows into the Truckee River and is listed for sediment and siltation. 33 road drainage work sites are planned including rocking, dip construction, ditch cleaning, culvert repair/replacement and road bed stabilization. Although not disclosed by SPI in the THP, there is 1 CA Spotted Owl territory within 1.3mi (PLA0130). 1 goshawk nest site was reported to be in the THP area from 2000, and both Mountain Beaver and Sharp Shinned Hawk sightings were reported in an adjacent watershed. The THP is also close to SPI’s Peak THP 2-10-073 PLA. More information is available on the THP Tracking Center website. Green Diamond Resource Company to clearcut near Big Lagoon and Redwood National Park. THP 1-13-048-HUM (BL2750 14 THP) Green Diamond Resource Company, 93 acres; 77% clearcut, 20% selection, 1% roadside, 1% no-harvest logging. Pitcher Creek (HUM: T9N R1E Sec.22, 23, 24, 27). Wet weather operations, moderate erosion hazard, landslide terrain, steep slopes up to 80%, herbicides, oversized units, coho watershed, 4 spotted owls within 1.3mi, running pine, trees up to 48" dbh. Estimated public comment deadline: 07/29/13. 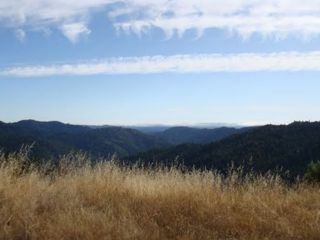 This THP is 4 miles east of Big Lagoon and Highway 101 near Redwood National Park at an elevation of 1,080 - 2,200 feet. Green Diamond Resource Company is planning a mostly clearcut tractor and cable logging operation in second growth redwood, Douglas fir, grand fir, hemlock and red alder in the upper reaches of Maple Creek drainage and Pitcher Creek. Maple Creek is an important Coho, Chinook, steelhead and coastal cutthroat trout fishery, and flows into Big Lagoon and the Pacific Ocean. Unit B contains steep streamside slopes, and an unstable area which is a shallow rapid landslide feature. There are 4 road drainage work sites including culvert repair, replacement and removal, and road bed stabilization. Units B and C are oversized, and Running Pine was found in Unit B. More information is available on the THP Tracking Center website. THP 1-13-047 HUM (Hely 13 THP) Humboldt Redwood Company, 280 acres; 69% group selection, 22% no harvest logging, 9% selection logging. Cummings Creek, Hely Creek (HUM: T2N R1E Sec.25, 36; T2N R2E Sec.27, 28, 30, 31, 33). Winter operations, moderate erosion hazard, steep slopes up to 75%, landslide terrain, debris slides, road failure sites, 10 road drainage work sites, impaired 303.d watershed, coho watershed, 15 spotted owls within 1.3 mi, trees up to 70” dbh. Estimated public comment deadline: 07/27/13. 41 landslide features including dormant landslides, compound landslides and debris slides. Ground based equipment will be used on steep slopes designated for cable logging, and 3 roads are planned for use on unstable soils with cut bank and fill slope failure problems. There are 10 road drainage work sites including rocking, dip construction, culvert repair and road bed stabilization. The THP area flows into the Van Duzen River which is listed as impaired for sediment and temperature, and contains steelhead and cutthroat trout. More information is available on the THP Tracking Center website. W.M. Beaty to log east of the Pacific Crest Trail on steep unstable slopes. THP 2-13-024 SHA (Little Owl Lake THP) W.M. Beaty & Associates, 3403 acres; 98% selection logging, 2% no-harvest logging. Clark Creek, Rock Creek (MD: T37N R2E Sec.11; T38N R2E Sec.14, 20, 23, 26, 27, 28, 29, 30, 35). Winter operations, high erosion hazard, steep slopes over 65%, steep roads, 15 unstable areas, road failure sites, 64 road drainage work sites, 2 spotted owls within 1.4 mi, fisher sighting, goshawk nest nearby, scattered large trees. Estimated public comment deadline: 08/01/13. 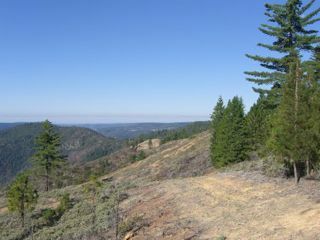 This THP is about 16 miles NW of Burney, CA and about 5 miles west of Highway 89 at an elevation of 3,520 - 5,480 feet. W.M. Beaty & Associates is planning a ground based selection logging operation in second growth mixed conifer forests. The THP contains a large number of poorly placed roads, skid trails and landings that are eroding, many of which will be abandoned after use. There are 15 unstable areas including debris flows, over steepened banks, and fill failures. Multiple existing skid trails and roads cross unstable areas, and the THP area contains multiple failed crossings. Tractors are proposed for use on skid trails on steep slopes over 65%, and on skid trails with a high erosion hazard, and on steep slopes that do not flatten before reaching a watercourse. 64 road drainage work sites are proposed including dip construction, rocking, culvert repair and replacement, ditch cleaning, and road bed stabilization. Several roads and skid trails are proposed for use in streamside areas, including a landing which is partially located within a streamside area. A goshawk nest tree was reported to be in Section 24, and a fisher was sighted within the THP area in 2013. The Pacific Crest Trail lies within a quarter mile west of the THP in Sections 20 and 30. More information is available on the THP Tracking Center website. THP 1-13-044 MEN (Flynnian Rising THP) Mendocino Redwood Company, 1315 acres; 35% seed tree, 33% transition, 25% group selection, 6% variable retention, 1% rehab, misc roadside logging. Flynn Creek (MD: T15N R16W Sec.2, 3, 10, 11, 12, 13, 14; T16N R16W Sec.25, 26, 27, 35, 36). Wet weather operations, high erosion hazard, steep slopes up to 80%, road failure sites, 62 road drainage work sites, herbicides, impaired 303.d watershed, coho watershed, 12 spotted owls within 1.3mi, trees over 34" dbh. Estimated public comment deadline: 07/19/13. 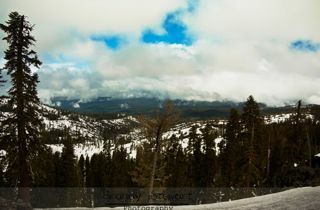 This THP is located 3 miles south of Comptche, CA at an elevation of 200 to 1,000 feet. 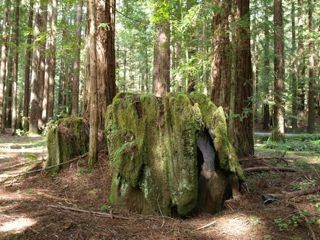 Mendocino Redwood Company is proposing a tractor and cable logging operation in second growth Douglas fir and redwood forests in the Flynn Creek watershed. 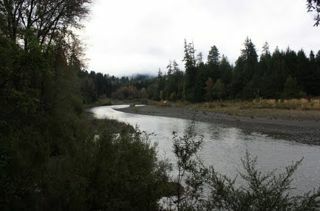 Flynn Creek drains into the North Fork of the Navarro River which is listed for temperature and sediment, and contains Coho salmon and steelhead. There are 62 road drainage work sites including dip construction, rocking, ditch cleaning, culvert repair and replacement, and some minor road bed restoration needed. 100 feet of new road is proposed in Unit 2 within a streamside area to access a landing located outside of the streamside area. 75 acres of alternative core areas are being proposed for spotted owl territories MD178 and MD489. The THP will reduce spotted owl roosting/nesting habitat by 87 acres, and foraging habitat by 35 acres. More information is available on the THP Tracking Center website. THP 2-13-023 PLA (Upper Brushy THP) Simorg West Forests, 620 acres; 35% seed tree, 28% clearcut, 23% group selection, 13% sanitation salvage, 2% no harvest logging. Big Mosquito Creek, Long Canyon, Brushy Canyon (MD: T13N R12E Sec.1, 3). Winter operations, high erosion hazard, steep slopes up to 70%, 1 unstable area, 18 road drainage work sites, herbicides, oversized units, 5 CA spotted owls within 1.3mi, scattered large trees. Estimated public comment deadline: 07/24/13. This THP is about 9 air miles east of the community of Foresthill, CA, and between 5.5 mi to 7.5 mi east of Oxbow Reservoir. Simorg West Forests which owns over 40,000 acres is planning a new THP in the Ralston Ridge and Brushy Creek areas near the Middle Fork of the American River. 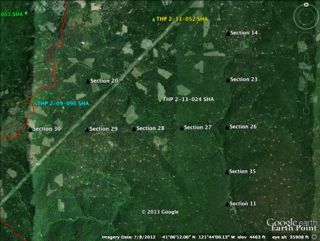 The THP area is close to the 2006 Ralston Fire which created large openings in the canopy. Simorg West Forests is planning a tractor and cable logging operation in mixed conifer stands at an elevation of 2,000 to 4,000 feet. 18 road drainage work sites are planned including dip construction, rocking, ditch cleaning and culvert work, and ground based equipment will be used on steep slopes exceeding 65% grade. Over 2,512 acres of skid roads are planned for use in streamside areas, and a landing will also be used in a streamside area. There are 4 oversized clearcut units planned. More information is available on the THP Tracking Center website. 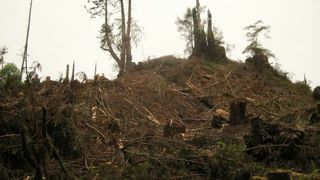 Sierra Pacific Industries planning clearcut THP near Pollock Pines. THP 4-13-007 ELD (Plumtastic THP) Sierra Pacific Industries, 508 acres; 66% clearcut, 30% no harvest, 5% selection logging. Plum Creek (MD: T10N R14E, Sec 3, 4, 5, 10, 11, 13, 14, 15, 23, 24). Winter operations, high erosion hazard, steep slopes up to 65%, slide area in unit 1291, 10 road drainage work sites, herbicides, 8 CA spotted owls within 1.3mi, goshawk within .25 mi, foothill yellow legged frog within 1 mi, pleasant valley mariposa lily, trees up to 42" dbh. Estimated public comment deadline: 07/18/13. This THP is about 8 air miles SE of Pollock Pines, at an elevation of 4,000 - 5,640 feet in mixed conifer stands. Sierra Pacific Industries is planning a mostly clearcut tractor and cable logging operation in the Plum Creek watershed which flows into the South Fork of the American River. There are 10 road drainage work sites planned including dip construction, rocking and culvert work, and 4,438 feet of new road construction planned. SPI is requesting an exception to be able to use tractors on steep slopes within units 1535 and 110 with a high erosion hazard rating, and within several units designated for cable logging. They also want to use tractors with brush rakes, and excavators for fuels work on slopes up to 50%. A slide area is located in Unit 1291 which was caused by side casting from prior landing construction. There are 4 California spotted owl territories within .50 mi of the THP, and 1 goshawk territory and sighting within .25 mi of the THP. Sierra Nevada yellow legged frogs were reported with 2-3 miles, and foothill yellow legged frogs were reported within 1-4 miles. Populations of Pleasant Valley Mariposa Lily were reported between Units 1545 and 1546, and near Unit 1160. More information is available on the THP Tracking Center website. Sierra Pacific Industries to clearcut log near the headwaters of the Cosumnes River. THP 4-13-006 ELD (Oregon Scott THP) Sierra Pacific Industries, 699 acres; 57% clearcut, 35% fuelbreak, 5% rehab, 3% selection, misc shelterwood logging. Oregon Gulch (MD: T8N R13E Sec.13, 21, 22, 23, 24, 26, 27; T8N R14E Sec.18, 19, 20). Winter operations, high erosion hazard, slopes up to 65%, 9 road drainage work sites, herbicides, 11 CA spotted owls within 1.3mi, goshawk sighting within .25mi, pleasant valley mariposa lily, red hills soaproot, trees over 24" dbh. Estimated public comment deadline: 07/12/03. This THP is about 7 miles NE of the town of Volcano, and a few miles north of the Sonora Pass Highway 88 in mixed conifer stands within the Scott Creek watershed. 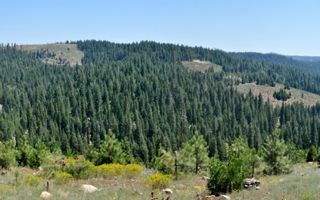 Sierra Pacific Industries is planning a mostly clearcut and fuel break tractor based logging operation at an elevation of 3400 - 4640 feet, with 33 acres of rehab logging in manzanita brush covered stands. There are 9 road drainage work sites including rocking, dip construction, culvert work and ditch cleaning, and 1 short length of existing road is proposed for use to access a landing through a streamside area in Unit 2995. 5 occurrences of Pleasant Valley Mariposa Lily, and 1 occurrence of Red Hills Soaproot were reported within the THP area. There are 2 CA spotted owl territories within .25 mi of the THP units, and a goshawk was sighted near the THP on USFS land. More information is available on the THP Tracking Center website. THP 2-13-021 TEH (Mesa THP) Collins Pine, 1582 acres; 100% group selection logging. Carter Creek, State Creek, Gurnsey Creek (MD: T28N R4E Sec.13, 23, 24; T28N R5E Sec.16, 17, 18, 19, 20, 21). Winter operations, high erosion hazard, steep slopes up to 60%, 70 road drainage work sites, herbicides, Chinook watershed, 12 CA spotted owls within 1.3mi, 2 osprey nest sites, goshawk sightings within .5mi, scattered trees over 40" dbh. Estimated public comment deadline: 07/17/13. This THP is about 6 miles SE of the town of Mineral, CA on the Sierra crest at an elevation of 4,500 to 5,700 feet near Lassen National Park. Collins Pine Company is planning a 100% group selection tractor and cable logging operation in mixed conifer stands. 70 road drainage work sites are proposed including rocking, dip construction, ditch cleaning and culvert repair and replacement, and 3 spur roads are proposed within streamside areas. The THP area has a rich history of wildlife sightings including; 2 osprey nest sites within the THP, 4 more osprey nests nearby, 7 goshawk territories nearby, 1 goshawk sighting within .5mi, a black backed woodpecker sighting within .5 mi of the THP, 10 Sierra Nevada red fox sightings and 3 willow flycatcher sightings nearby, multiple fisher and great blue heron sightings nearby, a great gray owl sighting in Childs Meadow and Greater Sandhill crane sightings nearby in Deer Creek Meadows, and finally the lone wolf OR-7 was sighted in the general area. More information is available on the THP Tracking Center website. THP 1-13-043 HUM (Fulton Ranch 2014 THP) Green Diamond Resource Company, 120 acres; 74% clearcut, 23% selection, 3% no-harvest logging. Upper Cannon Creek (HUM: T5N R3E Sec.4, 5; T6N R3E Sec.32, 33). Wet weather operations, moderate erosion hazard, slopes up to 50%, landslide terrain in Unit B, road failure sites, 17 road drainage work sites, impaired 303.d watershed, herbicides, coho watershed, 10 spotted owls within 1.3mi, scattered large trees. Estimated public comment deadline: 07/14/13. 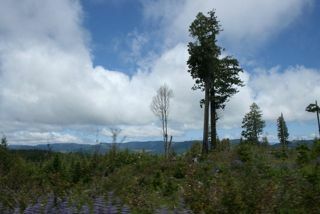 This mostly clearcutting THP is 12 miles east of Arcata, CA at an elevation of 1200 - 2800 feet. Green Diamond Resource Company is planning a feller buncher, shovel and cable logging operation in second growth redwood, and Douglas fir forests in the Canon Creek watershed. The Canon Creek watershed flows into the Mad River which is an important coastal cutthroat trout, steelhead, Chinook salmon and coho fishery and is listed as impaired for sediment, temperature and turbidity. There is a small area of landslide terrain in Unit B, and 9 road failure sites including cut bank, seeps, fill failure, gullying and channeling across the road bed. Over 8,500 feet of new temporary roads are proposed, and there are 17 road drainage work sites proposed including rocking, dip construction and culvert repair and replacement. Northern Spotted Owl sites were reported within .25 mi of Unit D, and .5 mi of Units A and E. Unit E is an oversized unit. More information is available on the THP Tracking Center website. Coastal Ridges planning THP on steep unstable slopes near Willits. THP 1-13-042 MEN (Lower McElhaney Plus THP) Coastal Ridges LLC, 627 acres; 55% transition, 20% seed tree, 16% group selection, 7% no-harvest, 3% rehab logging. Martin Creek (MD: T17N R14W Sec.3, 4, 9, 10, 11). Wet weather operations, high erosion hazard, landslide terrain, debris slides, road failure sites, steep slopes up to 75%, steep roads, 41 road drainage work sites, impaired 303.d watershed, herbicides, coho watershed, 2 spotted owls within 1.3mi, peregrine falcon within .5 mi, scattered large trees. Estimated public comment deadline: 07/14/13. This THP is 5 miles SW of Willits, CA at an elevation of 840 - 2,160 feet. Coastal Ridges LLC is planning a tractor and cable logging operation in redwood and Douglas fir forest on steep and unstable slopes. There are numerous road failure sites including gullying, fill failures and channelling across the road bed, and 41 road crossings needing rocking, dip construction, culvert repair and replacement, ditch cleaning and stabilization. A seasonal road is proposed through a debris slide area, and on steep slopes between 65% - 75% grade at 3 locations on a dormant landslide, and at 2 locations across a dormant rockslide. Road use is proposed in streamside areas, and there are steep road segments exceeding 15% for over 200 feet. The THP area drains into the Big River watershed which is listed for sediment and temperature, and has been degraded by past intensive logging. 17 acres of rehab logging is proposed in areas with large amounts of hardwoods, brush and scattered conifers. Northern spotted owl nesting and roosting habitat will be reduced by 11 acres, and foraging habitat will be reduced by 218 acres. More information is available on the THP Tracking Center website.